A great make ahead that you can toss in the freezer and thaw when you are ready. 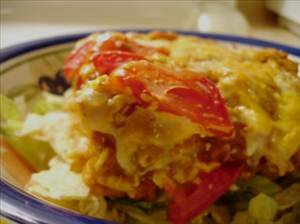 A hearty delicious casserole that will set your taste buds alive. Sensational layered tortillas and ground turkey with enchilada sauce and reduced fat cheese. With curry like spices this mouth-watering creamy turkey salad will become a favorite. Just like P.F. Chang's Lettuce Wraps, but made with ground turkey breast. A hot white chili that can use chicken, ground chicken or turkey or turkey chunks. Make those boring turkey cutlets taste amazing. Easy and quick. A great lowfat recipe that will put some zing into your turkey. Turkey bacon adds a smokey flavor when wrapped around stuffed and seasoned turkey tenderloins. A great low-carb snack or side. Turkey rolls with a cilantro mayonnaise spread. Simple turkey roll-up snack with a tasty dressing. no entries in your cookbook.